Units are very similar in appearance, but vary by early and late, and manufacturer application – and cannot be interchanged. Reference the Sonnax identification guide to verify the correct valve body is installed. 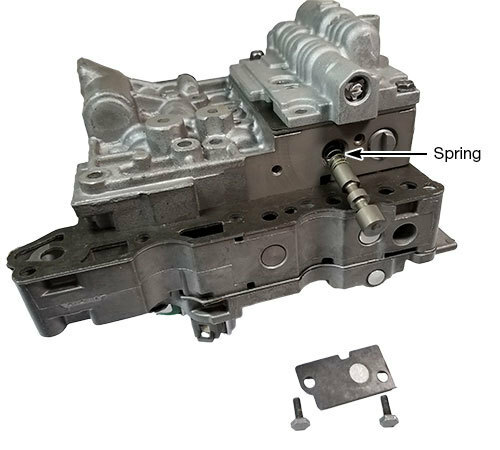 Sonnax remanufactured valve body AW55VL has been designed to address a host of common issues, such as: 2-3 shift concerns; delayed engagements; no lockup; burned clutches; inadequate lubrication failures; loss of gears; and various harsh upshift and downshift complaints. 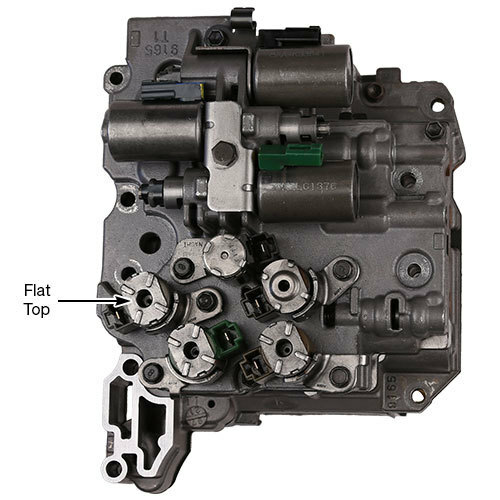 To guarantee the highest level of operational performance, this remanufactured valve boy is tested on state-of-the art equipment to verify that line pressure, solenoid modulator pressure, clutch pressures, and converter pressures match OE standards. 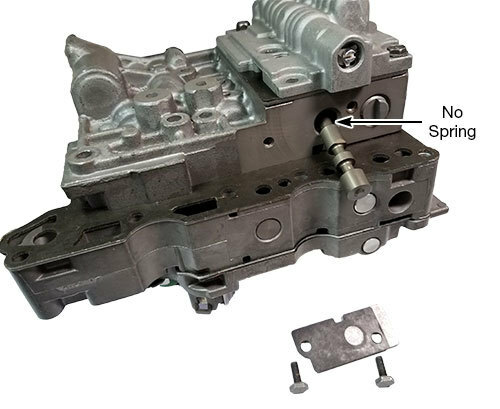 Remanufactured solenoids are included, and are independently tested for performance, then tested and tuned on the remanufactured valve body to ensure the unit functions correctly and is ready for bolt-in and the required re-adapt process in vehicle. The transaxle is manufactured by Aisin Warner, but is used by many car makers. Volvo calls it an AW55-50, Nissan and Infiniti call it an RE5F22A, GM (Chevy, Saab, Saturn and Pontiac) calls it an AF33-5. If vehicle type is not known check the S2 solenoid. A domed top on the S2 is a GM/Saab/Saturn/Suzuki. A flat top with four ribs radiating from the hole in the center of the S2 is a Nissan/Volvo. Look for a letter that is cast into the valve body to the right of the S4 solenoid hold down bolt. "No Letter/Blank Space" and valve bodies cast with a letter "A" are considered early. Valve bodies cast with a letter "B" or "C" are considered late. 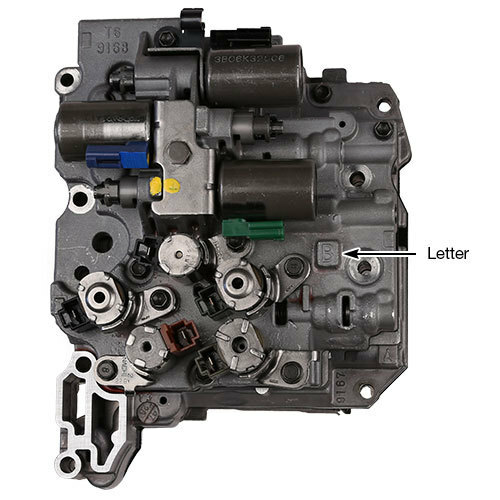 In model years '05-later, all Nissan and most GM/Volvo valve bodies may have a spring under the B5 control valve. It is very important to check the 10th digit of the VIN to verify production year. If the 10th digit of the VIN is 5 or higher, check your original valve body for a B5 control valve spring as shown. CAUTION: The wrong valve body will cause shift quality concerns. 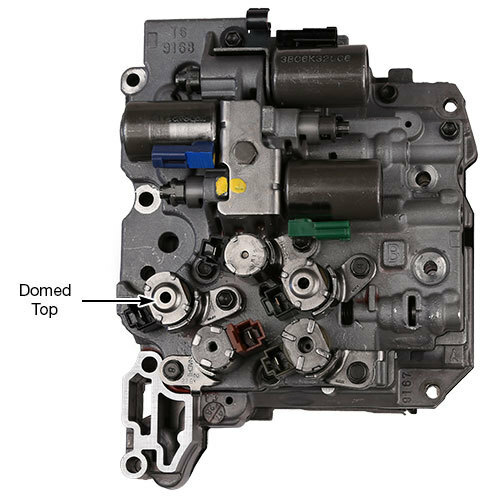 Remove the 2-bolt end plate and check under the B5 control valve to see if there is a spring. To avoid solenoid damage, please return the core in the Sonnax box with formed foam packaging that contained the purchased remanufactured valve body. Brackets are specific to code of valve body. 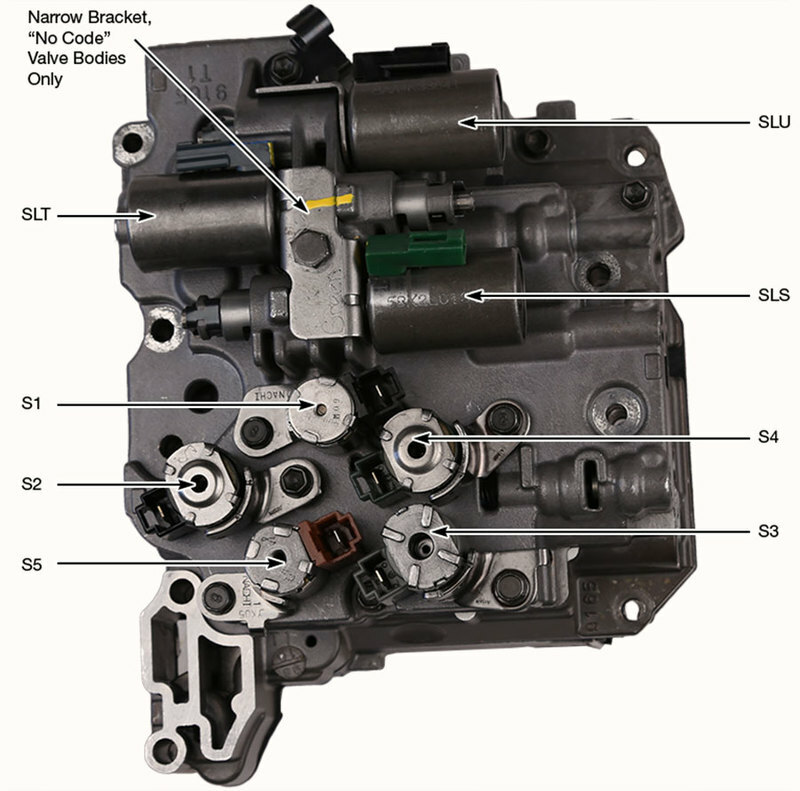 The "No Code" valve bodies use the narrow bracket with small notch above SLS solenoid. 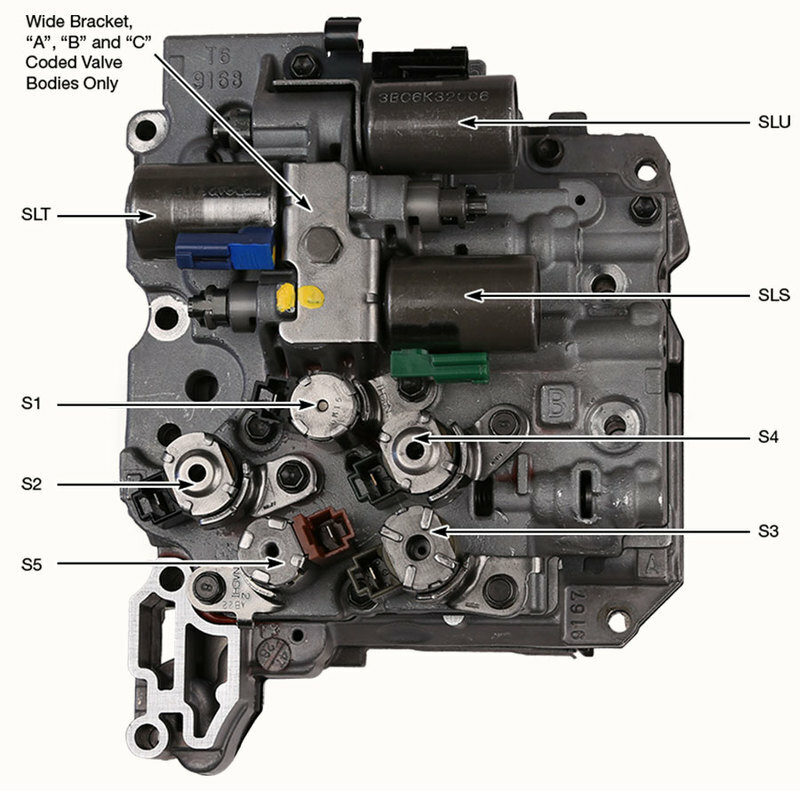 The "A", "B", and "C" coded valve bodies use the wide bracket with a large notch above the SLS solenoid. No code or code A valve bodies have the SLT and SLS electrical connector facing up. Code B or C valve bodies have the SLT and SLS electrical connectors facing down.